Abu Dhabi: The UAE will be welcoming Pope Francis, head of the Catholic Church, from February 3 to 5, on his first visit to the Gulf region, to participate in the Global Interfaith Conference on Human Fraternity, officials said on Monday. The Pope’s visit coincides with the visit of the Grand Imam of Al Azhar Dr Ahmad Al Tayeb, where the two prominent religious figures will hold a historic meeting to launch a global humanitarian message to consolidate the values of tolerance and brotherhood, coexistence and rejection of extremism, Mansour Al Mansouri, director-general of the National Media Council, told a press conference held at the Emirates Palace. Al Mansouri said the Pope’s historic visit to the Catholic Church in the UAE will make the country a capital of human tolerance, an opportunity to cement the ties of friendship and cooperation that characterised the UAE’s relationship with the Vatican for the benefit of humanity and the service of world peace. In the Year of Tolerance, the UAE will bring together the two great religious symbols to highlight the role of the country as the capital of human tolerance and highlight the role of the UAE in promoting the values of tolerance, love, coexistence between different religions and sects and rejecting hatred, extremism and racism. A Roman Catholic Bishop has been seated in the UAE since 1974. St. Joseph’s Cathedral is the seat of the Apostolic Vicar of Southern Arabia, Bishop Paul Hinder. St. Joseph’s was established nine years earlier, six years before the late Shaikh Zayed Bin Sultan Al Nahyan united the UAE as a nation in 1971. Over one million Christians (about one-ninth of the current UAE population) live and work in the country. While many different Christian faiths worship in churches throughout the UAE, most of the Christian population is Roman Catholic. “In the Year of Tolerance, the UAE will bring together the two great religious symbols to highlight the role of the country as the capital of human tolerance and highlight the role of the UAE in promoting the values of tolerance, love, coexistence between different religions and sects and rejecting hatred, extremism and racism,” Al Mansouri said. Dr Sultan Al Rumaithi, secretary-general of the Council of Muslim Elders, said the programme will include the inauguration of the region’s first historic mass to be marked by Pope Francis in the presence of 135,000 followers of the Catholic Church. The event will highlight the state’s efforts to promote the values of human tolerance and the commitment of the UAE to contribute to the creation of communities living in a spirit of tolerance. 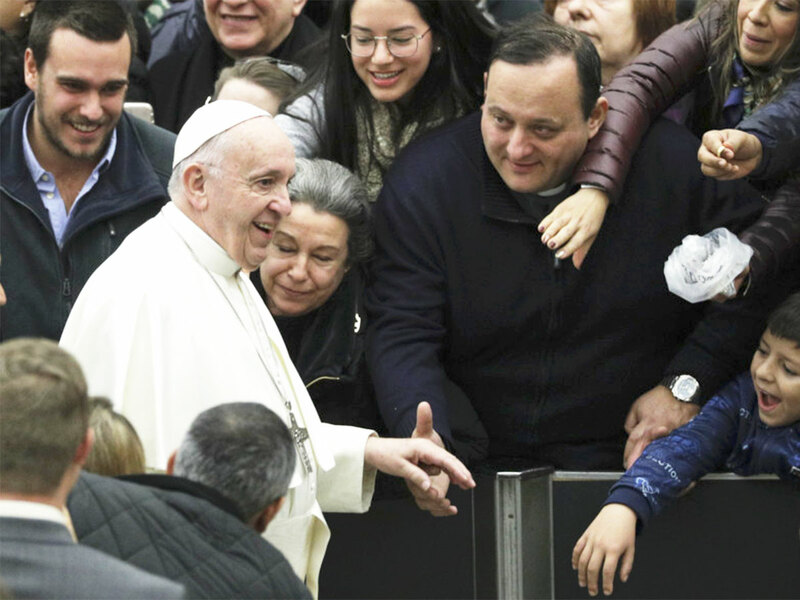 An estimated 135,000 Catholics from the UAE and abroad are expected to attend the mass to be marked by Pope Francis which will be held at Zayed Sports City and the roads leading to it. UAE has always been and remains the land of tolerance and coexistence. The first monastery and church found in the Sir Bani Yas Island dates back to the 7th century. Today, there are 76 churches and places of worship in the UAE for people of different faiths. The UAE has had a Roman Catholic bishop since 1974. St. Joseph’s Cathedral is the seat of the Apostolic Vicar of Southern Arabia, Bishop Paul Hinder. Over one million Christians live and work in our country. A majority of them are Roman Catholic.